The newest addition to the the Aprilaire dehumidifier line-up, the model 1830 is the perfect solution for smaller homes, townhomes, condominiums, crawlspaces and smaller basements. The 1830 provides a compelling combination of control and installation options, efficiency, quiet operation, and performance. The unit comes equipped with 10" collars on the intake and exhaust, which affords simple connection to the homes air handling system. Additionally - the 1830 offers options for fresh air ventilation, and zoned dehumidification - where the unit alternates between local area dehumidification, and whole house dehumidification. This zoned dehumification and fresh air ventilation options are accomplished via optional motorized dampers and the unit's on-board control panel. The 1830 is designed to dehumidify the air coming into the unit by passing the incoming air over an evaporator coil to drop the air temperature below the dew point of the air. Moisture if removed from the air and drained out of the unit to a common floor or waste drain. The air is then reheated in the condenser coil and exits the unit. Dehumidification occurs until the setpoint is reached, then shuts off until periodic sampling determines the need for operation. 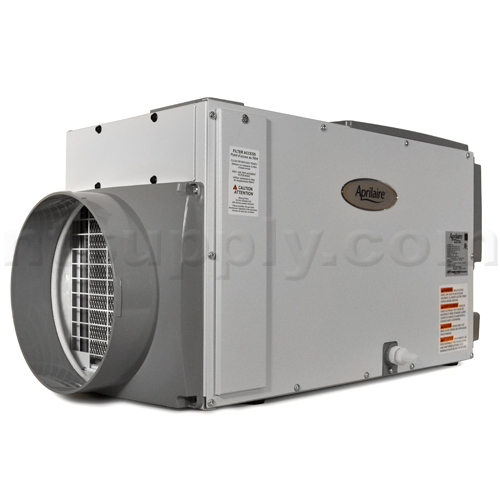 Airflow - 160 CFM @ .0" w.c. / 120 CFM @ .2" w.c. / 70 CFM @ .4" w.c.